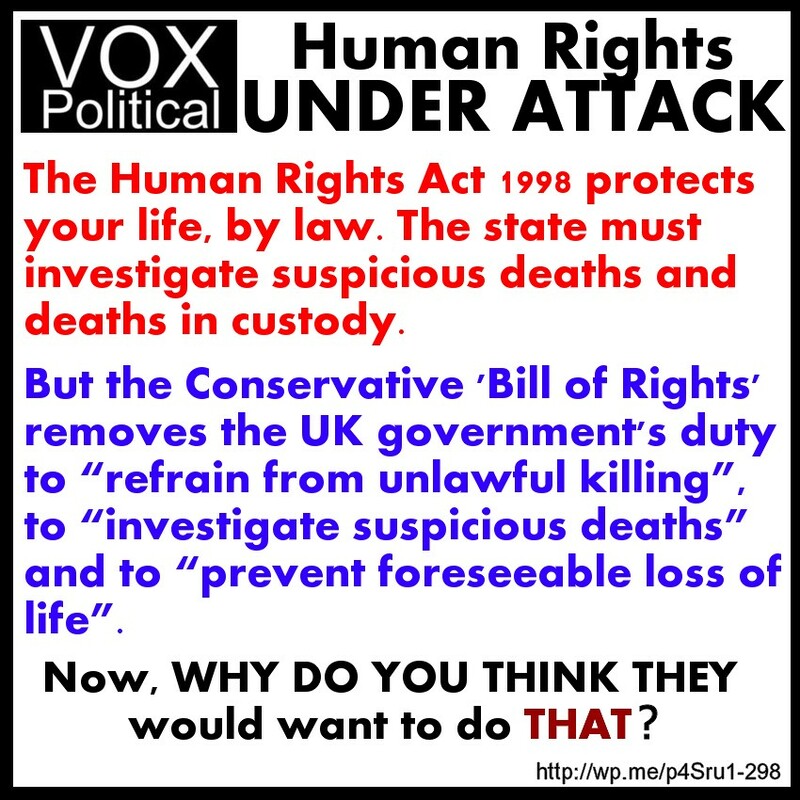 It’s possible some people may not know about the forthcoming repeal of the Human Rights Act by the Conservative Government, to be replaced by a Bill of Rights that seems more about what you won’t be allowed to do than what will be permitted. Here’s the first of what will hopefully become a series of infographics, illustrating the differences between what we have now, and what the Conservatives will deign to permit us. Nothing to do with Government prerogative to starve the peasants (workshy scroungers – sic)? Well done!! Thank you for this. What are we going to do to stop and challenge this? I’m going to research what the rights-related organisations are doing, and put an article together with all the options laid out (hopefully). Don’t bode well for the protesting ‘thugs’, nurses and the like. People should be asking themselves why politicians wish to deprive them of their fundamental rights. It certainly isn’t for the benefit of the people that’s for sure. It’s more likely that they’re removing it to reduce the cost of appeals against deportations to countries that will kill or torture those being returned to them. Also to allow discrimination on the basis of religion or one of the other protected groups. I’m not discounting the chance that they’re planning on removing it so that they can introduce a form of indentured servitude (slavery) for the unemployed, disabled and debt ridden by forcing them to work for benefits. Never mind that this will remove paid employment opportunities for those capable and willing to work. I’ve got a few more of these infographics to do, yet, so your opinion may evolve over the next few days.